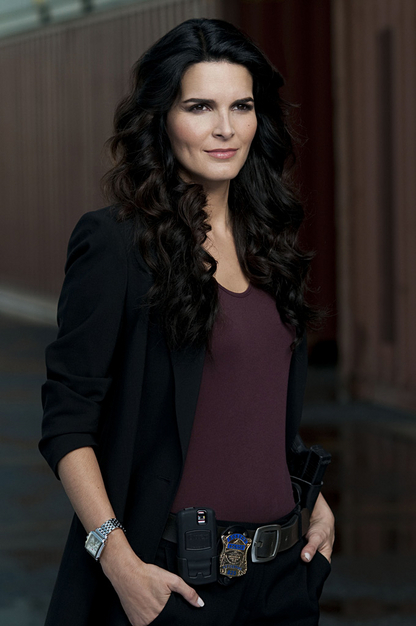 Angie Harmon plays Jane Rizzoli in the TV series. My review of Blood Line by Lynda La Plante & The Silent Girl by Tess Gerritsen in yesterday's Melbourne Age. Lynda La Plante is one of Britain’s most accomplished screenwriters and crime novelists. Originally from Liverpool she trained as an actress and appeared regularly on British television in the 1970s, in everything from Z Cars to Rentaghost. Her breakthrough into screenwriting was with the acclaimed series Widows about the spouses of four deceased armed robbers and their plans to carry out a heist. La Plante’s follow up series Prime Suspect won her an Edgar Award and Helen Mirren’s performance as the tough, uncompromising DCI Jane Tennison set the bar so high that none of the female television cops who have followed in Tennison’s wake have come close to matching it. Blood Line is the seventh book in La Plante’s Anna Travis series. Travis is a younger, hipper, more vulnerable detective than Tennison and her character has grown from a raw rookie cop in Above Suspicion to a confident lead investigator in Blood Line. The book begins as a missing persons case. A man called Alan Rawlins, a devoted son to his elderly parents, a considerate boyfriend and an all round good egg has vanished from his flat. A pool of blood is discovered under the bed of the vanished man and it becomes clear that he’s either been killed or he’s killed someone else. However, at least initially, Travis has to work hard to convince her superiors that a crime has been committed at all. The central story of Blood Line is the unravelling of Rawlins’s complicated past. La Plante does this in a manner so meticulous that it might leave some readers impatient for action, but which I found to be fascinating. La Plante really understands the Zeitgeist and the novel is full of conversations about house prices, music, television and there’s even a detour to Britain’s trendy surfing capital of Newquay, Cornwall. There are parts of Blood Line which are very grisly indeed and it begins with a bound, terrified man being horrifically beaten with a club hammer. La Plante is such a skillful writer and has such a loyal fan base that I wonder if these moments are quite necessary. We read La Plante for her deft plots, her understanding of police procedure and her unpacking of the relationships between men and women, not for shocking violence. The Silent Girl by Tess Gerritsen also has its heart the story of a missing person. It is the ninth Rizzoli and Isles mystery in the enjoyable series about Boston PD’s Detective Jane Rizzoli and her medical examiner colleague Maura Isles. The Rizzoli and Isles books are already best sellers and the books have now inspired an American TV show starring Angie Harmon. This level of success can often be a mixed blessing for a novelist, but Gerritsen has not let the quality control slip, in fact, with this volume she seems to be hitting her stride. As you would expect from a retired MD the scenes Gerritsen writes for Isles in The Silent Girl, are compelling, but in this novel it is Rizzoli who is the lead. Rizzoli and her team uncover a female body on a Boston rooftop covered with silvery hairs that may nor may not be human. As Rizzoli hunts down the leads she finds a link to a twenty year old murder/suicide in which a Chinatown cook supposedly shot a waiter, three customers and himself at the famous Red Phoenix restaurant. Rumours have been circulating for years that the cook didn’t do it and Rizzoli begins to have doubts herself. Meanwhile, as she pursues this case, she discovers that two missing local girls have surprising links to the Red Phoenix murders. The setting in Boston’s Chinatown lets Gerritsen explore some of her own heritage growing up as a second generation Chinese American in San Diego. The Silent Girl allows its characters room to breathe and takes them on a more interesting personal journey than we see in the standard mystery thriller. Both Lynda La Plante and Tess Gerritsen’s female protagonists are competent, assured professionals who operate in a collegiate atmosphere where their skills are respected and appreciated. Times have changed since 1972 when P D James could title a procedural An Unsuitable Job For A Woman. In the midst of all this mayhem and bloodletting it is the women who use their smarts to crack the case, put the evil men behind bars and set the world to rights. As in life, men may create, conquer and destroy but civilization is made by the women.